If your companion animal has 4 paws then I an able to assist with enabling their lives to be enhanced through massage, whether it be through traditional remedial massage or with the use of an Accell Dog Mat and hand held unit (vibration therapy) or with Reiki. 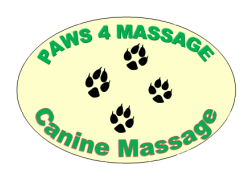 Canine massage therapy is a form alternative therapy that promotes a dog's health. It is proven that the touch given to a dog through massage can improve not only a dog's physical but also its mental and emotional well-being. Massages are great for dogs who suffer from nervousness, anxiousness, hyperactivity, arthritis, hip dysplasia and recovery from surgery. I am a qualified Remedial Canine Massage therapist as well as qualified for Animal Reiki Massage - cats, birds, rabbits even snakes and lizards. Recently I have added Accell Therapy to my business - this is a 3D vibrational system which circulates through 4 feet of bone and 2 feet of tissue to the cellular level. Its an Australian product which has been around since 1949 - its safe and non invasive. I aim to provide affordable services so that the health and well-being of your furry companions can be regular. Cash or credit/debit card payments accepted.